And one final poor leadership approach is to lead with no confidence, rudeness, insincerity, or just flat out in a way that you show everyone you don’t know what you are doing. That quickly loses everyone’s confidence, and often even causes resentment. The second reason why leaders fail is because either they have no humility or they have an extreme lack of humility. This is similar to the Know-it-All mentality that I explained last week. Leaders without humility often lack a willingness to continue learning, especially from those viewed as inferior. These leaders are often viewed as egotistical. The third reason leaders fail is because they lack work ethic. There is a natural tendency that when people get a leadership role they stop doing the very things that earned them the leadership position. They stop working as hard. At number four, leaders fail when there is no accountability. This goes two ways. Either the leader coddles people and doesn’t hold they accountable for what they agree to get done, or they aren’t held accountable for their own actions so they do whatever they want. Either way it does not work out well for those they lead. The fifth reason why leaders fail is because they either don’t step up to be the leader in the moment they are needed, or they are a silent leader. Have you ever been in a situation where someone needed to step up and take the lead to get something done? Often, the leader jumps up and does it, but some times they sit back and watch others waiting for something to happen. What happens? Often nothing happens and that is where the problem lies. The other scenario is where a leaders leads by staying silent. That makes everyone they lead think they fully support the decisions being made and sometimes that is not a good thing. If leaders always stay silent, it sets the precedent that those they lead must also stay silent and just do their job by staying between the lines. Now, we are going to take a quick break for our sponsors and when we come back, we will go through the following five reasons why leaders fail. If this has happened to you, you have probably experienced number six where your leader intentionally or unintentionally set you up for failure. When leaders don’t provide people with proper training and then expect them to get the job done, this is unfair to the individual and the team. What’s worse is that you are sending the wrong message to everyone that you will also hold them accountable for unrealistic expectations. Number seven, is when leaders don’t deal with the issues at hand. Instead, they escalate the issue by passing it to HR, the next level of leadership or management, or some other department. I like to call this passing the buck. The eighth reason why leaders fail is that they have a short-sighted vision or focus. This often happens when they focus so much on the here and now, the upcoming projects or workload, or vision to help the next few months only to lose track of the long term goals. At number nine, I received multiple leadership failures that all related to change, so I am going to call it difficulty with change. The difficulties with change fell into two categories: inability to change and ineffective change. And finally, at number ten, leaders fail when they have poor communication. This happens when they don’t communicate, they communicate poorly, or even when they say too much. There are definitely things that must be kept confidential for proprietary, personnel, or legal reasons, but there are a lot of things that fall outside that realm. When leaders are secretive about things they could share, it only causes problems with those they lead. What do I mean when I say poor communication? Well, every time we speak, convey our message by more than just the words we say. Our tone, cadence, body language, and overall demeanor impacts the message we convey. That can all be used very effectively, but it can also be done ineffectively which leads to poor communication. There’s also over-communicating. This occurs when people say much more than they should, talk about things before they have been properly vetted, or are still formulating ideas. Have you ever had someone tell you they were going to do something only to tell you they changed their mind a few minutes, days, or weeks later? This often happens when people over communicate. Another example of over-communicating is what happens with the various news outlets. They often hear a bit or piece of news and spread it only to find out that they were missing key pats. They then come back later to change or correct what they already said. When communicating as a leader, chose your words, tone, body language and timing very carefully so you communicate the message you intend to communicate at the right time. In some of the upcoming episodes, I am going to go into much more detail on these items individually. Coming up next week though, I am going to have a great interview I did with Joseph Paris. He’s a thought leader in operational leadership, and an international entrepreneur, consultant, writer, speaker, and mentor. Joseph has devoted his entire career of over 30 years to helping companies become high-performance organizations. Be sure to check it out next Monday, May 21st when it goes live! I’d also like you ask you a special favor. If you enjoy the Leadership Done Right Podcast, the best way you can say thank you is by going to your podcast player and writing a review. That will help the podcast get more exposure so other like minded people can listen to it. You can also share each episode with your social networks, coworkers, and others you think would benefit. 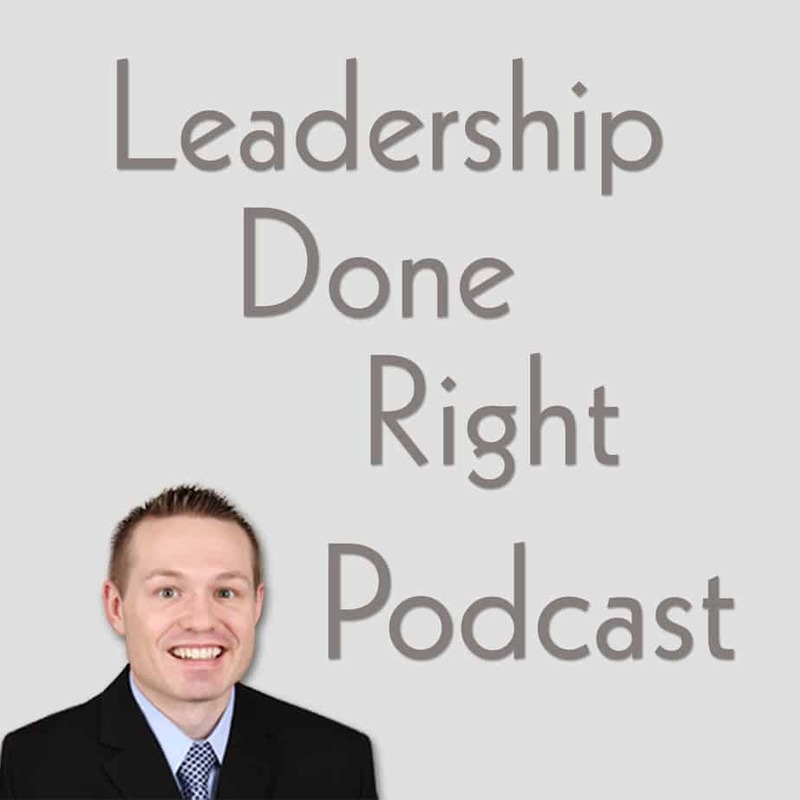 That helps more people hear about this podcast and grows the Leadership Done Right community. Well, thanks again for listening! My goal is to help you become a great leader, now go be the best leader you can be!